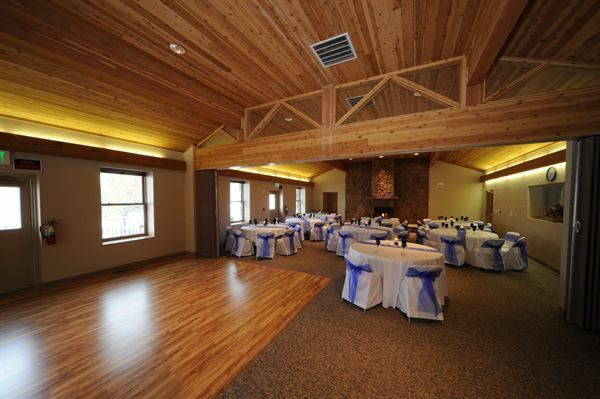 Stonehaven Event Center presents a perfect setting for your Colorado wedding. In the foothills of the Rampart Range of the Rocky Mountains, you have a view like none other. On the campus of Mt St Francis, the environment is stunning. The Stonehaven Center is beautiful with pine ceilings, stone fireplaces, friendly deer to greet you, and a Staff that will take care of your wedding needs. Come and see. We would love to show you our beautiful facility and surroundings. The Package Includes: • Wedding consultant & coordinator • Classic 3-Tier Wedding Cake • Consultant & planner for service providers • Premium cake cutting service • Outdoor or indoor ceremony • Potato or Taco Bar by Aspen Pointe • Onsite rehearsal the night before • DJ & indoor sound system from Complete Music (5 hours) Rates: Classy Wedding Package 50 Guests $4800 Classy Wedding Package 120 Guests $6100 Please review our attachment for more details. The Package Includes: • Wedding consultant and coordinator • Consultant & planner for service providers • Outdoor or indoor ceremony • Onsite rehearsal the night before • DJ & indoor sound system from Complete Music (5 hours) • All day event time • Classic 3-Tier Wedding Cake Please review our attachment for more details. The Package Includes: • Wedding consultant and coordinator • Consultant and planner for service providers • Outdoor or indoor ceremony • Onsite rehearsal the night before • DJ and indoor sound system from Complete Music (5 hours) • All day event time • Classic 3-Tier Wedding Cake • Premium cake cutting service • Catered Reception by Aspen Pointe Catering Rates: Exquisite Wedding Package 50 Guest $5775 Exquisite Wedding Package 120 Guest $7360 Please review our attachment for more details. Stonehaven can host up to 120 guests.